This lovely property has lots character and bucket loads of potential. The property does need a good amount of work but all worth it as this could be a gem of a property. The barn is perfect for renting out if needed or to make into a garage and workshop. The property is semi-detached at the moment but this could be changed by knocking down a small ruin there is to the side. The property on the ground floor, has a kitchen area, a pantry, a good size living room and then an area that would be great as a snug which is where the staircase is leading up to the first floor. The first floor has a further two bedrooms and a space that could be used as an office or a single bedroom. There is a second living room here also as well as a good size landing. Now to the outside. 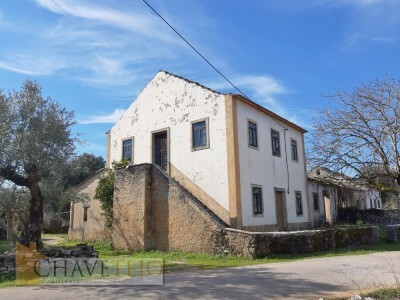 As mentioned earlier there is a separate barn because of this and the amount of land that comes with the property, this would the perfect opportunity for anyone looking to start up a rural tourism or country retreat. The land is mostly flat and has lots of different types of trees. It also has two wells for irrigation. The property does have a large plot but only 6420m2 of this is attached to the property, the rest is around 10 metres away from it.